Austin Insulated Window Blinds announced its plans to unveil a new type of cost-effective, energy efficient insulated window treatment that makes it affordable for everyone to cover the windows in their hottest rooms during the summer and coldest rooms during the winter with 1" R-Value 6 or 2" R-Value 13 insulated window blinds. This will allow homeowners and apartment renters to block heat gain from the sun during the summer and prevent heat loss through windows during the winter, which can save up to 15% to 25% on cooling/heating bills. The weakest links in a home's energy envelope are its windows. Even when the power is on, a tremendous amount of heat seeps out of a home's unprotected windows. But what happens when 150,000 homes in North Carolina and 90,000 customers in New Jersey are watching a blizzard dump several feet of snow in a matter of hours and then they suddenly lose their electricity for a day or more? Insulated Window Blinds are perfect solution for protecting a home's windows during these types of extreme weather events. Most homes have one window for every 100 sq. ft. of space. A typical-sized window measures 3' x 5' for a total of 15 sq. ft. of unprotected glass. Multiply that times 25 windows and it adds up to 375 sq. ft. of glass that is basically freezing or heating a house through its unprotected windows at whatever the outside temperature is. Blinds, shades and shutters help, but they still leak a ton of energy through conduction, convection and radiation (UV Rays). "After working for a long time in the solar industry, one of the ways we developed business leads was to offer free home energy audits," said Robert Hoskins, Front Page PR's Director of Crowdfunding. "During these home energy audits we could offer a number of EnergyStar energy efficient replacements for lights, appliances, etc., but windows were always a big problem." "Most people knew that they needed to replace their old single pane windows, but they simply did not have the budget to install 25 triple pane windows at a price tag of $1,000 each. And even for customers that could afford them, the payback period was so long and the ROI was so small that people would simply choose not to install them," Hoskins added, "This is why we created our Insulated Window Blinds, which offer customers a great way to protect their home's windows 1" or 2" insulated foam boards that will block a great deal of heat from seeping out of their windows in the winter and reject heat gain from penetrating windows during the summer." 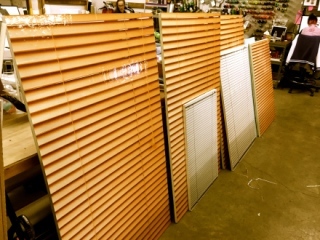 "The insulated foam boards we use are printed with high-resolution pictures of window blinds, shades or shutters that look just like the real thing on both the inside and outside of the window. The only way to find out that they are not real is to reach out and touch them," Hoskins continued. "Or if people prefer, we can print high-resolution pictures of beautiful landscapes such as waterfalls, snow capped mountains, white sandy beaches or even famous works of art." The Insulated Window Blinds are perfect for hot places like Arizona, New Mexico, Texas, California and Florida as well as cold locations like Alaska, Colorado, Idaho, Wyoming, North/South Dakota, Minnesota, Wisconsin, Illinois, Michigan, Pennsylvania, New York and other frigid places. The Insulated Window Blinds will be sold through Do-It-Yourself (DIY) retailers, energy efficiency and solar installation companies, interior designers, remodelers, handymen and other types of construction businesses that are familiar with measuring to a 1/16th of an inch with a tape measure and knowing how to operate an infrared laser thermometer or infrared scanner. The Insulated Window Blinds are easy to install and take about one-second to insert into a window if measurements have been recorded correctly. Insulated Window Blinds, Shades and Shutters will be pre-sold first through the firm's upcoming Indiegogo crowdfunding campaign. The first 500 customers that buy one or more of the insulated window boards will receive a huge discount. Most printers will charge around $14/sq. ft. to print a single large format vinyl job. Based on our predicted volume we plan to offer a starting price of $10/sq. ft., but hope to decrease that price over time. The products on the crowdfunding campaign will be offered at a 50% discount on the 1st day of the crowdfunding campaign.